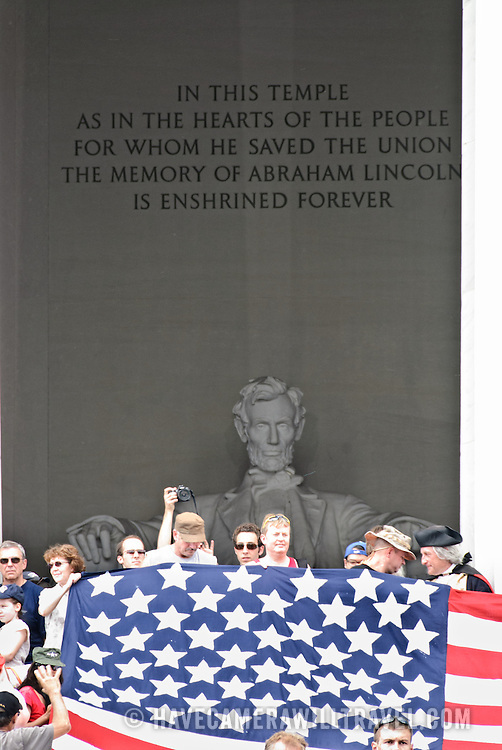 Statue of Abraham Lincoln in the background of attendees of the Tea Party rally of 08.28.10. Conservative television commentator Glenn Beck's "Restore Honor" conservative rally at the Lincoln Memorial on the National Mall, held on the 47th anniversary of Dr. Martin Luther King's famous "I Have a Dream" civil rights speach of 1963. Speakers from the stage erected on the lower steps of the Lincoln Memorial included Beck himself along with former vice presidential candidate Sarah Palin.